Restore Complete Access Database Items i.e. Tables, Queries, Forms, Macros etc. MDB repair tool is the complete solution to quickly fix the corruption issues of Access MDB & ACCDB database files. It is capable of repairing the corruption in the database which arises due to system failure, Trojan infection, hardware failure, the inconsistent design of the database, Jet Engine Error etc. 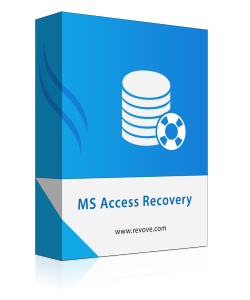 The MS Access Recovery Tool is one of the best to repair corrupt ms access files. It recovers the data from linked table also efficiently without loss of any byte of information. It preserves the linkage of internal database tables with external database tables while extracting data from corrupt database. It is smartly built to locate the MDB file from the local storage. After Scanning the file the mdb repair tool loads the file for preview in a hierarchical manner. It allows you to view the content to check the consistency of a database. For the view, you have to select the table, then it automatically previews its content with complete details. 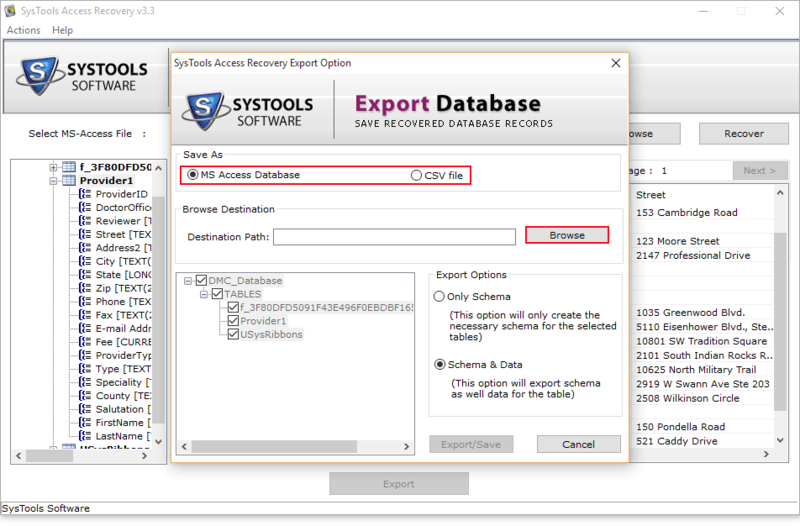 MS Access Repair tool facilitates you to export the selective access database object or items to save on local storage. For this, you have to select the desired tables and export it. It is the default functionality of ms access repair tool to export the complete scanned data to save on user defined location. With the help of MDB Repair tool, you can retrieve the permanently deleted items of Microsoft Access database file. It effectively recovers the deleted data from the corrupt database and allows you to export the items like Queries, table, forms, macros etc., directly into MS Access database. It maintains the formatting and structure of data as well while restoring. It also provides the features to save the data with or without the schema. 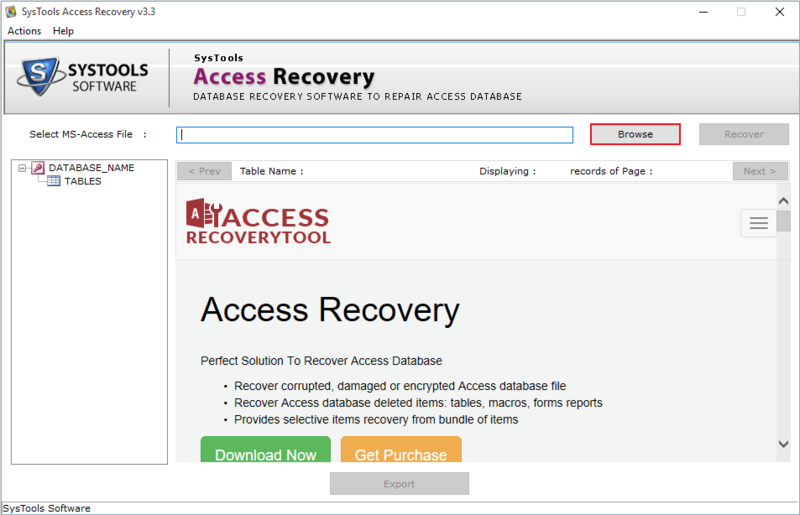 Microsoft Access Recovery Software provides you the two unique option to save the recovered data. Save in CSV:- This facilitates you save the MDB file in CSV file format, which you can easily access in Excel file. 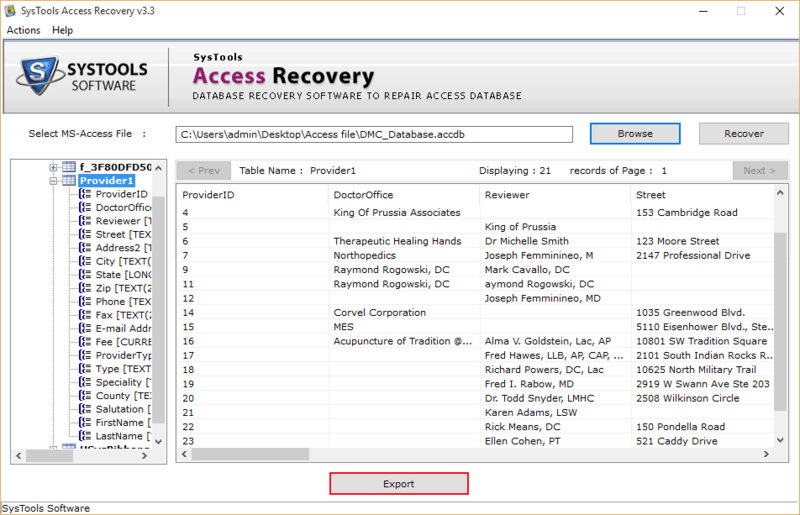 Demo version of MS Access Database Recovery tool only preview the content. It does provides export facility. Does the software preserve table linkage information? Yes, Software preserves information related to table linkage and also allows you to recover data from linked tables. Can I recover deleted table also using the software? Yes, The software is built specially to recover the deleted items like tables, forms, macros, queries from the corrupt ms access database. Can I use the Access Database while recovery process? No, You cannot use the database while recovery process in progress. This will affect the speed of recovery. Is there any file size limitation exist to use MDB file? Will the software maintain the internal structure of table while recovery? Yes, the software maintains and preserves the internal structure of the database. Does MS Access Installation necessary to repair mdb file? Yes, MS Access Application installation is necessary to recover items from corrupt ms access files. Can I use the software to repair the jet engine issues also? Yes, You can easily repair the jet engine error using the MDB recovery tool. 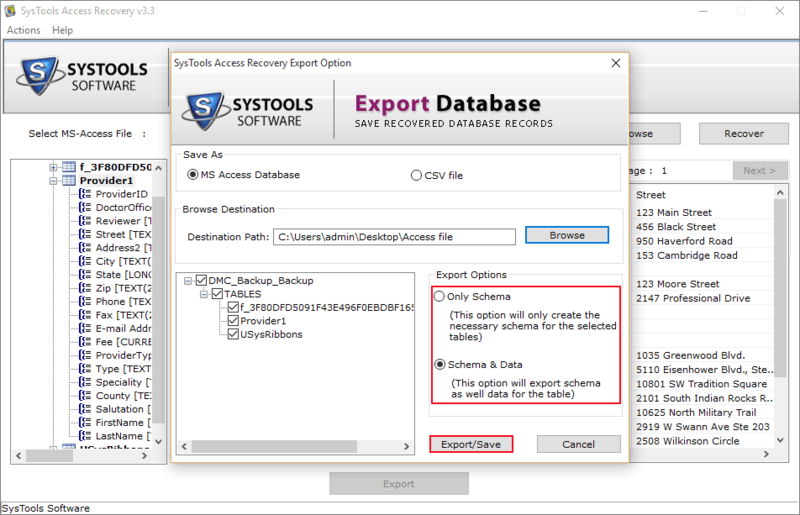 “One of the best tool to recover data from corrupt ms access database”. Before using MDB Recovery tool, I have used many tools but did not get any quality results. Seriously, I have wasted my time and money as well in such a garbage software. Now I am using the best tool to repair corrupt mdb file. The demo version of the tool is free to download and check its highly consistent features to experience the difference and innovation. I am very thankful for such great software.